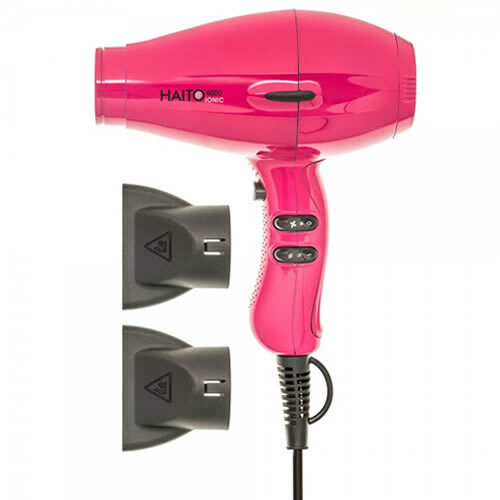 Brilliant ionic dryer with powerful motor for soft, shiny, silky results. The Haito 4600 Ionic Hair Dryer is as powerful as it is flexible. It has a 2000W AC motor that generates an impressive airflow of 90m³/hour. It has a ceramic ionic generator, courtesy of a a Tourmaline-infused grill and filter, which means it creates an effective source of negative ions. This helps make your clients' hair soft, shiny and silky, as well as being moisturised and in healthy condition. It features a 2-way speed control and a 3-way temperature control, and includes an ever-handy cold shot button, giving you great control. It also has a built-in thermostat for safety cut-off. 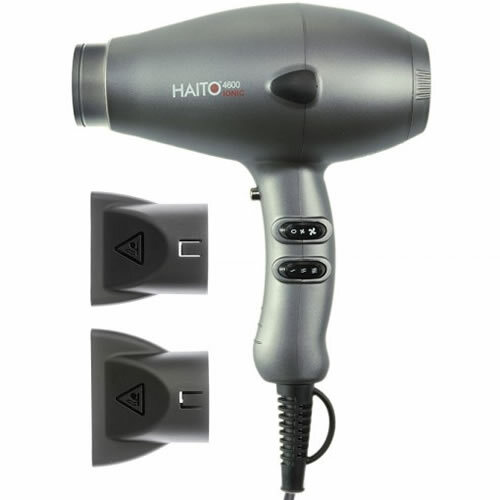 It comes supplied with 2 precision styling nozzles and a 3-m professional-length cable. Further, it has an easily-removable filter and locking ring meaning that maintaining it is a breeze! Available in black, blue, gun metal and pink. Ionic? : Emits negative ions for sleek, shiny results. £23.94 (inc. VAT) Why no VAT? We're a trade wholesaler and quote our prices without VAT to help our VAT-registered customers understand the true cost of a purchase. Top quality professional diffuser designed to fit most makes of professional hair dryers and especially all Haito, Hair Tools and Dana Italia models. It'll also fit all Parlux hair dryers apart from the 3500 and 3800. Straighten hair as you blow dry with this easy-to-use pik attachment. 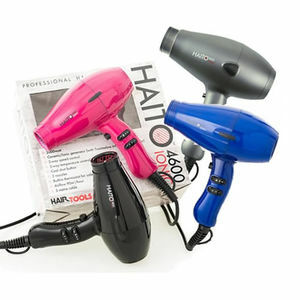 It features a silicone attachment point that fits most hairdryers. Extra-strong vented teeth mean it'll cope even with thick, afro hair. Best pair of scissors I have ever purchased, after going through numerous pairs of toni&guy sissors I found these. I bought them around 10 years ago and I have only had them sharpened once. Amazing product.